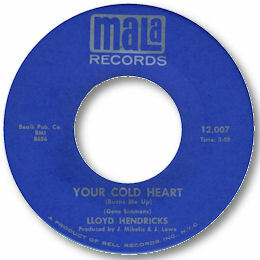 From his Tupelo MS base indie record man John Mihelic produced fine music on such strong vocalists as Big Ben Atkins, Joyce Jones, Larry Hobson, Ann Bogus and Sonny Holley but his best find was Lloyd Hendricks. His Statue 45s like "The harsh white light" and "Don't cry no more" are good, and the version of “Don’t Cry No More” was fiery enough while the mid paced flip “Hooked On Love” showed just how convincing his hoarse tones could be. But his cream cut was Your Cold Heart written by Memphis rocker Jumpin’ Gene Simmons. This country soul classic is just sensational from the subdued organ that holds it all together to the “plucked” guitar fills and chorded piano. And although the horns are ace and the gentle girl chorus come in just right the focus is really on Hendricks to deliver. And he certainly does. The cornball lyric becomes something more when Lloyd puts his soul on the line. The timing of his delay is delicious and the throaty cries of “somebody help me” towards the run out put the icing on a truly excellent cake. No wonder Mihelic was able to lease it out to Mala. If only Hendricks had made more discs like this one. UPDATE ~ Record man Joseph Wilson has very kindly been in touch with further info on Lloyd Hendricks. Joseph was the leader and drummer of the Lost Souls who backed Lloyd on his recordings - as well as many other Statue artists. He says that several other sides were in fact cut on Lloyd and gices their titles as "I Apologize", "We Had a Thing Going On", "If I Can't Run to You I'll Crawl" and "The Squat". Mouthwatering especially his version of "If I Can't Run to You I'll Crawl" - let's hope they make the light of day. You can read more about Joseph's fascinating career in the music business on other pages on this site referred to in the first para of this one. Note ~ "Your Cold Love" can be found on the fine Sundazed double CD "Looking For My Baby".